(wt. % NaCl 25-15) در کلسیت های پهنه گارنت بیشتر از شوری میانبارهای سیال دوفازی غنی از مایع (wt. % NaCl 10 تا 20) در کلسیت های پهنه مگنتیت است. مقادیر δ13C و δ18O کانی کلسیت (15 نمونه) کانسار آهن نوکه به ترتیب از 9/1- تا (PDB) ‰ 1/0+ و از 4/19- تا (SMOW)‰ 9/14- در تغییر است. مقدار میانگین δ18OWater محلول گرمابی در کانسار آهن نوکه ‰ 58/17+ نسبت به استاندارد SMOW است که با مقادیر آب ماگمایی اولیه متفاوت است. 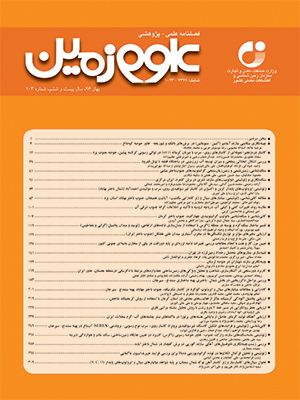 پیریت فاز اصلی سولفیدی موجود در کانسار آهن نوکه است و مقادیر δ34S این کانی (9 نمونه) از 9/3+ تا (CDT) ‰ 4/5+ تغییر می کند که نشان دهنده سولفور با منشأ ماگمایی است. داده‌های میانبارهای سیال و ایزوتوپ های پایدار کربن، اکسیژن و گوگرد گویای این است که سیال‌های کانسارساز به وسیله آمیختگی شوراب های ماگمایی با آب جوی گسترش یافته است و احتمالاً ژنز کانسار آهن نوکه مشابه کانسارهای نوع اسکارن است. The Nukeh iron deposit is situated at the north of Semnan and at south of Central Alborz structural zone. Volcano-pyroclastic rocks with Eocene age are the host of this deposit. Iron mineralization occurs as massive, disseminated, vein and breccia types in the Nukeh deposit and magnetite, hematite, pyrite, chalcopyrite, garnet, epidote, quartz and calcite are the main minerals in this deposit. Fluid inclusions and stable isotopes (O, C, S) have been used to reveal the physico-chemical characteristics of hydrothermal fluids and genesis of the Nukeh Fe deposit. Seven types of fluid inclusions are identified in quartz, according to the phase numbers, which include, liquid inclusions (L), liquid-rich inclusions (L+V), vapor-rich inclusions (V+L), vapor inclusions (V), simple brine inclusions (L+V+S), halite-bearing liquid inclusions (L+S) and opaque-bearing liquid-rich inclusions (L+V+O). The ranges of homogenization temperature and salinity of liquid-rich fluid inclusions in quartz are 100-200˚C and 10-20 wt. % NaCl equivalent, respectively, whereas the ranges of homogenization temperature and salinity of vapor-rich fluid inclusions are 350-500˚C and 10-30 wt. % NaCl equivalent, respectively. Also homogenization temperature and salinities of liquid-rich fluid inclusions in calcite in garnet (type a) and magnetite (type b) zones is 75-125 ˚C but the salinity of fluid inclusions in calcite in garnet zone (15-25 wt. % NaCl) is more than salinity of these inclusions in magnetite zone (10-20 wt. % NaCl). δ13C and δ18O values of calcite (n=15) vary between -1.9 to +0.1 ‰ (VPDB) and -19.4 to -14.9‰ (SMOW), respectively. The average value of δ18OWater is of +17.85‰ (SMOW) in the Nukeh Fe deposit is different from the values for the primary magmatic fluid. Pyrite is the main sulfide mineral in the Nukeh Fe deposit and δ34S values of pyrite (n=9) is within the range of +3.9 to +5.4 ‰ CDT . The source of sulfur is considered to be magmatic on this basis. Fluid inclusions and stable isotopic (O, C, S) data suggest that the ore-forming fluids evolved by the various mixtures of magmatic brines and meteoric water and probably the genesis of the Nukeh Fe deposit is similar to skarn deposits. شاه‌حسینی، ا.، قاسمی، ح. و فردوست، ف.، 1386- تشکیل اسکارن در حاشیه توده گرانیتوییدی نوکه، شمال خاور سمنان. یازدهمین همایش انجمن زمین شناسی ایران، دانشگاه فردوسی، مشهد. شهری، م.، صادقیان، م. و لنتز، د.، 1389- نتایج آنالیز مایکروپروپ کانی­های سازنده اسکارن­های کلسیک آهن­دار شمال سمنان. بیست و نهمین گردهمایی علوم زمین، سازمان زمین­شناسی و اکتشافات معدنی کشور، تهران. صمدی، م.، 1377- پتروگرافی، پتروژنز و ژئوشیمی سنگ­های آذرین شمال تا شمال خاور سمنان، پایان‌نامه کارشناسی ارشد، دانشگاه تربیت معلم، ایران، 162 ص. غیاثوند، ع.، قادری، م. و رشید نژاد عمران، ن.، 1384- سنگ شناسی، دگرسانی، ژئوشیمی و منشأ ذخایر آهن شمال سمنان. دهمین همایش انجمن زمین‌شناسی ایران، دانشگاه تربیت مدرس، تهران. غیاثوند، ع.، قادری، م. و رشید نژاد عمران، ن.، 1388- کانی­شناسی، ژئوشیمی و خاستگاه کانسارهای آهن شمال سمنان، مجله علوم زمین 72 (18): صص. 33 تا 44. Bodnar, R. J. and Beane, R. E., 1980- Temporal and spatial variations in hydrothermal fluid characteristics during vein filling in preore cover overlying deeply buried porphyry copper type mineralization at Red Mountain, Arizona. Economic Geology 75: 876–893. Bodnar, R. J., 2003- Introduction to aqueous fluid inclusions. In: Samson, I., Anderson, A., and Marshall, D. (Eds. ): Fluid inclusions: Analysis and interpretation. Mineralogical Association of Canada, Short Course 32: 81-99. Bodnar, R. J. and Vityk, M. O., 1994- Interpretation of microthermometric data for H2O-NaCl fluid inclusions. In Fluid Inclusions in Minerals, Methods and Applications, B. De Vivo and M.L. Frezzotti, eds., pub. By Virginia Tech, Blacksburg, VA: 117-130. Cunningham, C., 1978- Pressure gradients and boiling as mechanisms for localizing ore in porphyry system. Journal of Research U.S. Geology Survey 6: 745-754. Drummond, S. E. and Ohmoto, H., 1985- Chemical evolution and mineral deposition in boiling hydrothermal systems. Economic Geology 80: 126–147. Faure, G. and Mensing, A., 2005- Principles of isotope geology, 2th edition, Johm Weily and Sons, New York, chapter 25, 460P. Friedman, I. and O'Neil, J. R., 1977- Stable isotopic fractionation factors of geochemical interest. U.S Geol. Surv. Prof. Pap.:440KK. Gilg, H.A., Lima, A., Somma, R., Belkin, H. E., Devivo, B. and Ayuso, R. A., 2001- Isotope geochemistry and fluid inclusion study of skarn from Vesuvius. Mineralogy and Petrology 73: 145-176. Hedenquist, J. W. and Henley, R. W., 1985- Effect of CO2 on freezing point depression measurement of fluid inclusions: Evidence from active systems and application to epithermal studies. Economic Geology 80: 1379-1406. Hoefs, J., 2009- Stable isotope geochemistry, 6th edition, Springer Verlag, Berlin Heidelberg New York, 293P. Hurtgen, M. T., Arthur, M. A. and Prave, A. R., 2004- The sulfur isotope composition of carbonate associated sulfate in Mesoproterozoic to Neoproterozoic carbonates from Death Valley, California. In: GSA Special Papers 379: 177-194. Larson, L. T., Miller, J. D., Nadeau, J. E. and Roedder, E., 1973- Two sources of error in low temperature inclusion homogenization determination and corrections on publish temperatures for the East Tennessee and Laisvall deposits. Economic Geology 68: 113-116. Niiranen, T., Manttari, I., Poutiainen, M., Nicholas H. S., Jodie, O. and Miller, A., 2005- Genesis of Palaeoproterozic iron skarns in the Misi region, northern Finland. Mineralium Deposita 40: 192-217. Ohmoto, H., 1972- Systematics of sulfur and carbon isotopes in hydrothermal ore deposits. Economic Geology 67: 551–578. Ohmoto, H., 1986- Stable isotope geochemistry of ore deposits. Rev Miner 16: 491–559. Rollinson, H. R., 1993- Using geochemical data: evaluation, presentation, interpretation. Longman, U.K., 352P. Sharp, Z., 2006- Principles of stable isotope geochemistry, chapter 10:409P. Shepherd, T. J., Rankin, A. H. and Alderton, D. H. M., 1985- A practical guide to fluid inclusion studies. Blackie, Glasgow 239 P.
Shimazaki, H., 1980- Characteristics of skarn deposits and related acid magmatism in Japan. Economic Geology 75: 173-183. Sun, J. G., Hu, S. X., Shen, K. and Yao, F. L., 2001- Research on C and O isotopic geochemistry of intermediate-basic and intermediate-acid dykes in goldfields of Jiaodong peninsula. Acta Petrologica et Mineralogica 20, 47-56 (in Chinese with English abstract). Taylor, Jr., H. P., 1974- The application of oxygen and hydrogen isotope studies to problems of hydrothermal alteration and ore deposition. Economic Geology 69: 843–883. Wilkinson, J. J., 2001- Fluid inclusions in hydrothermal ore deposits. Lithos 55: 229–272. Zang, W. S., Wu, G. G., Zhang, D. and Liu, A. H., 2004- Xinqiao iron–deposit field in Tongling, Anhui: geologic and geochemical characteristics and genesis. Geotectonica et Metallogenia 28: 187-193 (in Chinese with English abstract).